Represents a normal (Gaussian) distribution. The NormalDistribution type exposes the following members. Initializes a new standard normal distribution. Initializes a new normal distribution with the given mean and standard deviation. Gets the median of the distribution. Computes the expectation value of the given function. Computes the normal distribution that best fits the given sample. Generates the given number of random variates. Returns the point at which the cumulative distribution function attains a given value. Returns the probability density at the given point. Computes a raw moment of the distribution. A normal distribution is a bell-shaped curve centered at its mean and falling off symmetrically on each side. It is a two-parameter distribution determined by giving its mean and standard deviation, i.e. its center and width. Its range is the entire real number line, but the tails, i.e. points more than a few standard deviations from the means, fall off extremely rapidly. A normal distribution with mean zero and standard deviation one is called a standard normal distribution. Any normal distribution can be converted to a standard normal distribution by re-parameterizing the data in terms of "standard deviations from the mean", i.e. z = (x - μ) / σ. Normal distribution appear in many contexts. In practical work, the normal distribution is often used as a crude model for the distribution of any continuous parameter that tends to cluster near its average, for example human height and weight. In more refined theoretical work, the normal distribution often emerges as a limiting distribution. For example, it can be shown that, if a large number of errors affect a measurement, then for nearly any underlying distribution of error terms, the distribution of total error tends to a normal distribution. 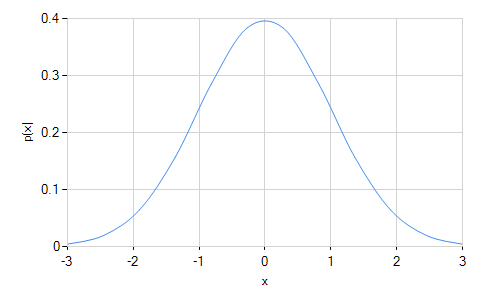 The normal distribution is sometimes called a Gaussian, after the mathematician Friedrich Gauss.